An unofficial black ink change technique for the Epson SP9880 and SP7880. The 9600 trick we used can’t be used on the 7880/9880 so this trick might work for you. It’s a common criticism of the larger Epson printers that they waste an exorbitant amount of ink when you swap black inks. This has finally been addressed on the 7900/9900 (and 3800) but older printers are expensive to change. A non chip replacement method (as per our 9800/7800 ink swap page) for swapping black inks. Should cost under $10 in ink and paper. We have a version of this procedure for the 4880, with pictures of the display sequence. Just remember that messing up your machine by doing something like this won’t be covered under warranty! It involves simultaneously holding down the “Centre”, “Down” and “Right” buttons (on the control panel) as you turn the printer on. This isn’t good, since it uses quite a bit of ink. Whilst we suspect you could dispense with stage 3, we’ve now done two ink swaps on the 7880 and followed the procedure exactly, both times. Remember – the printer is not a cheap bit of kit, and you do this at your own risk! I’ve tried it twice on our printer and am now happy to use the technique on our 7880 – not yours! See also the notes towards the end of the article. You will need to pay attention to pressing the correct buttons in the group of 5 to the right of the display screen. In particular, the Centre button (*), the Right button (>) and the Down button (v). We’ve had several comments from people using this technique and are happy to include feedback on its use. I’ve seen this process mentioned elsewhaere and there has been some confusion with the precise steps involved – As a result I’ve expanded the instructions from the original set that we were sent, hopefully to make things somewhat clearer. We’re told the procedure won’t work if the low ink warning is on, however we had a report of a successful change when the PK ink cart to be taken out was almost empty. Although an ink charge (S3) was not requested, Stage 4 was needed to get all the level indicators to display correctly. We have a version of this procedure for the 4880, with pictures of the sequence. 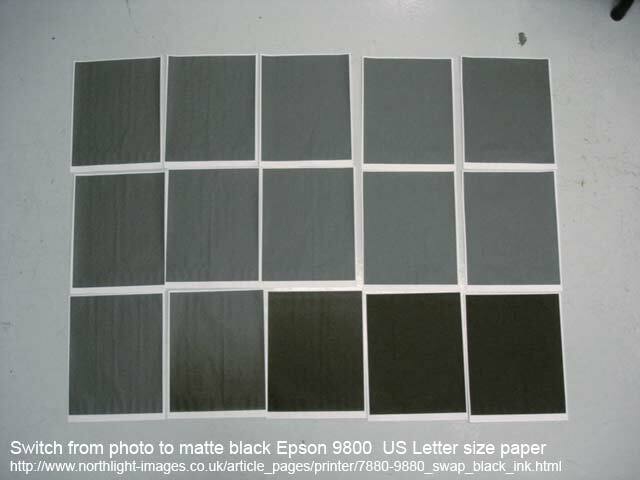 Remove the ink cartridge you wish to change (Matte or Photo Black) and put the new different Photo or Matte Black in. Ensure the lever is returned to its usual ‘locked’ position. Turn on the printer and make sure to simultaneously hold down the Centre(*), Down(v) and Right(>) buttons at the same as you turn the printer on. The LCD display will show ‘SELF TESTING’. The display shows ‘JM Init. FILL’. Press the Down(v) button to scroll down the display until ‘INK PARAMETER’ appears on the LCD display. As before, turn on the printer and make sure to simultaneously hold down the Centre(*), Down(v) and Right(>) buttons at the same as you turn the printer on. You have now swapped cartridges, but there is ‘old’ ink in the lines leading to the print head. You can flush this out by printing something solid black. You may need to use a custom print size, however you could easily print out on A4/letter sheets of copier paper. Put each printed sheet next to one another and print one at a time. You should be able to see where the black changes after a several sheets (quite a few for the 9880!). When you look at the finished print you see that 2/3 is matte ink as it looks dark and the rest of the print looks a little dull with Pk ink on matt paper. The system is now charged with photo black. The SP9880 uses about 20-22ml of ink. The black image is 43″x40″. The original inspiration for this technique (aka ‘westshore’ method) are at inkjetgiclee.com Thanks to an industry insider for pointing us to this one! Feb 2011 – We hear that this works just fine with Asian models of the 7880 (Malaysia) – there have been suggestions that the firmware is different from UK/US versions.